Shaare Emeth is proud to be designated as a “welcoming congregation” by HIAS, an American-Jewish nonprofit that provides humanitarian aid to refugees. Join us for a special Shabbat service in which we will shine a light on our responsibility as Jews to support and connect with refugees and asylum seekers. We are excited to welcome to the service a number of New American Families with whom our congregation has developed meaningful relationships. After services, information will be provided about how you can support New American Families in our community. 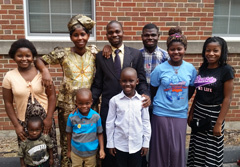 Freddy Lumande (center) and his family were resettled in St. Louis, Mo., from Burundi, where he worked as a Baptist pastor and church planter. His church, located in the capital, was working to strengthen churches in more rural communities. He and his oldest son have found good jobs, and the other children are happy attending school. Still, he struggles with the knowledge that his family, friends and church members still in Bujumbura, where violence has plagued the capital for several months. He balances a modest budget to support his growing family here while sending money home to Burundi to support the rest of his family and the efforts of the church there. Israa and her husband, Ali, settled in St. Louis in December of 2016. Israa is a talented cook and has had her food featured at both Shaare Emeth Trivia Night and a B’YachadSTL event this past year. 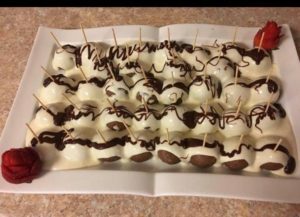 We look forward to having desserts by Israa after Refugee Shabbat.